Bishop Gerard Clifford lived out his motto "May they all be one" says Cardinal Brady. The former Primate of all Ireland, Cardinal Séan Brady, has paid tribute to his fellow bishop and close friend Bishop Gerard Clifford, who died on Monday of this week. Cardinal Brady was giving the homily at the funeral Mass at the Church of Saint Patrick, Dundalk, Co Louth at 12.00 noon yesterday. During the Mass, the chief celebrant, the current Primate of All Ireland, Archbishop Eamon Martin, read a message which Pope Francis had sent for the funeral. The Holy Father was saddened to learn of the death of Bishop Gerard Clifford, went the message, which assured clergy, religious and lay faithful of the Archdiocese of Armagh of his “heartfelt condolences”. Fr Clifford’s interest in ecumenism, which was so decisive for his life, stretched back to his student days, when his theological degree was awarded for a study of ministry in the Anglican Church. After Pope Saint John Paul II’s visit to Ireland in 1979, he was a natural choice to be part of the Catholic Church’s response to the pope’s invitation for the churches to work more closely together. 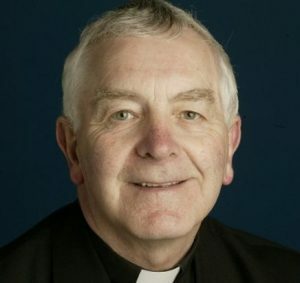 Working in close co-operation with fellow clergy from other churches, in particular Canon William Arlow, he organised ecumenical talks twice a year between the diocese and Saint Anne’s Cathedral, Belfast, and inter-church services in Armagh Cathedral during the Week of Prayer for Christian Unity. In 1984 Fr Clifford was appointed first full-time executive secretary of the Irish Bishops’ Conference and ordained bishop in 1991. As a bishop, he served as a member of its Council for Ecumenism. He was a member of the Episcopal Commission for Pastoral Care, and President of CURA from 2010 until 2013. In his spare time Bishop Clifford, described by Cardinal Brady as “a dear friend, a good and faithful priest and an outstanding brother bishop”, had a great love of gardening, painting, and walking in the foothills of the Cooleys. “Now that the curtain has come down on his personal life on earth, we ask the Lord to draw back the other curtain to let him see the light of eternal day. There every tear will be wiped away and that other garden – the Garden of Paradise – will be revealed. The vision will be infinitely more glorious, where even the splendour of the Cooleys and Dundalk Bay will have to take second place!” he concluded.